I SHOOK UP THE WORLD by Ali, MARYUM: Beyond Words Pub Co 9781582700908 Hardcover, First Edition., Signed by Author(s) - Vagabond Books, A.B.A.A. 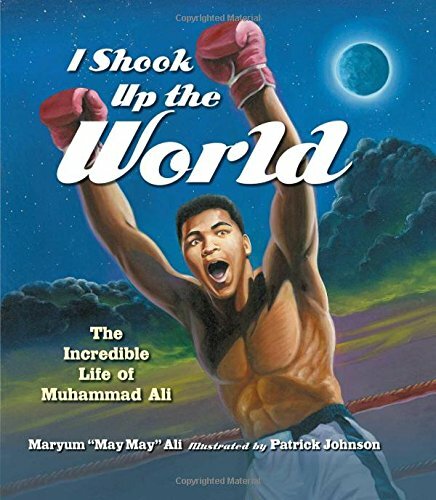 I Shook Up the World is an illustrated tribute to Muhammad Ali written by his oldest daughter, Maryum. The book tells Ali’s story from the beginning to the present—how he started boxing, earned an Olympic Gold Medal, won the heavyweight championship, worked for civil rights, and made a principled stand against the Vietnam War. Ali’s trademark rhyming, a joy to him and the bane of his opponents, in interspersed throughout the “rounds” (chapters). Young readers will appreciate Patrick Johnson’s colorful illustrations and the introduction provided by the great man himself. A historical timeline of Ali’s life is included. Maryum Ali is the oldest of nine children in the Ali family. Currently, she works as a stand-up comedian, with at-risk youth, and writes screenplays and children's stories in her spare time. Maryum has also made numerous TV appearances on talk shows and sitcoms. Maryum lives and works in Los Angeles.